"It stood to reason that both life and death began with a spark of light." From the Author's End Notes: "The first step is to talk to each other--and more important-- to listen. We may not see eye to eye, but we can respect each other's opinions and find the truth in them. Perhaps in those honest conversations, instead of demonizing each other, we might see each other as imperfect humans, doing our best." Jodi Picoult has done it again. She's written a wonderful book about a really tough subject that has been in our headlines for years. Hopefully, instead of negativity and censorship, people will use this book to start conversations and hopefully create understanding of the differing views for both sides. The characters in this book are people that we can all identify with on some level. They are so well written that the reader feels like they're friends. Wren, 15 years old, goes to the women's health care clinic with her aunt. While she is there, a man with a gun comes in and starts shooting and then holds the rest of the patients and the doctor hostage while he decides what to do next. The next few hours are terrible and Wren shares them with several memorable people - Olive an older lady, a nurse who is pregnant with problems of her own, a woman who has just had an abortion and the doctor who performed the abortion along with an under-cover anti-abortion person who was trying to get inside information on the clinic. The other main character in the story is Wren's Dad, Hugh, who is a police hostage negotiator who is shocked when he finds that his daughter is one of the hostages. All of these people have a story that brought them to this place at this time. This is a fantastic book and needs to go on everyone's TBR list because I can promise you, it will be a major topic of discussion once it is published. I like the first paragraph -- very mysterious. I think I know what its about however. I read the author's last book which, I think, is a lead-up to this one. I didn't know it was out yet, so I'm glad you featured it. This is one I want to read. Margot, I hope you get a chance to read A Spark of Light and enjoy it as much as I did. This is the second time I've seen this today! Picoult always has contemporary themes. She does stay up to date with her themes, doesn't she? I hope you get a chance to read this and enjoy it as much as I did. Second time seeing this today, I'd keep reading. I hope you get a chance to read it and enjoy it as much as I did. This is a popular book. 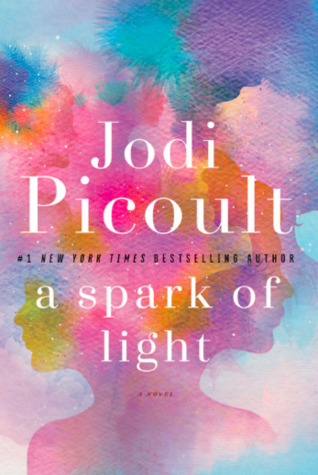 Jodi Picoult's books get a lot of interest when they come out. I hope you get a chance to read this and enjoy it as much as I did. I really liked Small Great Things, so I expect this one to be just as good!